Out of Eden Learn- Year 11 Student’s interview with Project Zero researchers. Over the last four years, the English as an Additional Language (EAL) Year 11 students have participated in the learning program, Stories of Human Migration, and this year the Year 8 English students have the opportunity of collective global discussions in Core Learning Journey 1: The Present and the Local. In addition, for the last two years, Year 5 students have participated in connecting and communicating with children of a similar age from different parts of the world. In 2018, the Year 6 cohort has maintained their involvement, taking part in Core Learning Journey 2: The Past and the Global. Out of Eden Learn is a collective learning experience initiated by Project Zero at the Harvard Graduate School of Education. It has three unique curriculums called ‘Learning Journeys’ that evolve around Paul Salopek, a National Geographic Pulitzer Prize-winning journalist who is following ‘the ancient pathways of human migration’ in a 21,000-mile walk across Africa, India and Asia. These learning programs take inspiration from Salopek and his ‘dispatches’ as he walks to new places and meets the local people. Students engage with Salopek’s “slow journalism”- his evocative photography, videos, interviews and articles by posting their own stories and having online conversations with other students. This year, the 8 students had conversations about their neighbourhood with students across America, Mexico and from Kazakhstan. The building blocks of the Wilderness School Global Consciousness Framework involve the skills for students to engage in respectful and meaningful dialogue online by providing authentic opportunities to engage in real-world experiences. In their online conversations, students on Out of Eden Learn use the ‘dialogue toolkit’ that prompts them to think critically, to recognise and name perspectives and to stop and think of others with empathy, valuing human dignity and cultural diversity. The Out of Eden Learn project goes beyond developing Global Consciousness skills, attitudes and values as it complements more traditional disciplines. At Wilderness School, it is seamlessly integrated into language and literacy for the EAL Stage 1 SACE and has recently been recognized as an exciting new approach, being published as a pre-approved SACE endorsed Learning and Assessment Plan (LAP) on the Stage 1 EAL minisite. For the Year 8 English students Out of Eden Learn complements the Narrative Voice learning-module. For Middle and Senior students, this has consisted of students writing posts in response to the Out of Eden Learn readings and videos and responding to other students around the world as they follow Paul Salopek’s global walk. 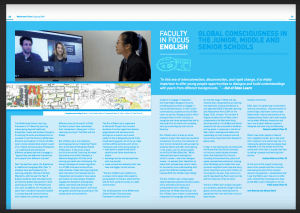 In Year 5, the experiences correlate with the Humanities and Social Sciences curriculum, exploring key concepts within the Australian Curriculum, including interconnections, place and space, perspectives and action. Among other footsteps, girls create their own personal neighbourhood map and story, which they share online with children in the program. As well, they construct a world map depicting Paul’s epic journey and the many countries he visits. The Out of Eden learn project has given our students a powerful insight into the global community, enabling them to appreciate their own and other cultural experiences. Eden Learn is a great way to slow down and look around you. I became aware of some things I had never come across before when I had to take photos of my neighbourhood. Eden Learn also helped me consider different viewpoints and learn more about different people’s lifestyles and what they do differently. When I saw other people’s maps of their neighbourhoods I got to see what their viewpoint is of where they live. It is really quite astonishing how people have migrated to all the places around the world and I think that it is great that Paul is talking to people and learning their stories. At the core of this project is learning about other people and their cultures and seeing the world from another person’s perspective. I slowed down and I saw that Eden Learn has a lot to offer and I noticed that the people who have joined Eden Learn have given a lot to. Harvard Graduate School of Education 2018, An introduction for Out of Eden Learn, accessed 24 September 2018, <https://learn.outofedenwalk.com/about/>. James, C 2018, ‘ENRICHING DIALOGUE ON OOEL: NEW MOVES FOR OUR DIALOGUE TOOLKIT’, Blog post, 13 September, accessed 24 September 2018, <https://walktolearn.outofedenwalk.com/2018/09/13/enriching-dialogue-on-ooel-new-moves-for-our-dialogue-toolkit/>. OECD PISA 2018, PISA 2018 Global Competence, accessed 24 September 2018, <http://www.oecd.org/pisa/pisa-2018-global-competence.htm>. This post is published in the Wilderness Times magazine and is written by Ann Rooney and Alison Short- Wilderness Junior School Teacher and Project Zero Classroom Graduate. Tagged Alison Short, Global Consciousness framework, Learning that Matters, Out of Eden learn. Bookmark the permalink.